The U.S. Department of Health and Human Services reports that nearly 70% of Americans turning age 65 will need long-term care during their lifetimes, which makes the staggering cost of nursing home care even more alarming. According to the Genworth 2015 Cost of Care Survey, the national median rate for a private room in a nursing home is $250 per day, which amounts to $91,250 a year. These figures represent a 4.17% increase over 2014. Even those residents who are willing to settle for semi-private rooms can expect astronomical costs. The national median daily rate for a semi-private nursing home room is $220, or $80,300 a year for 2015, which represents a 3.77% increase in cost over the previous year. Why Are Nursing Home Costs So High? As discussed in a CNN Money article, there are a number of factors driving nursing home costs up, according to Bob Bua, vice president of Genworth. Those factors include increasing costs of insurance, food, labor, building maintenance, etc., which are being passed along to the residents. 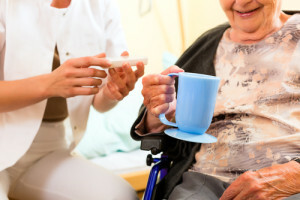 Staffing costs for nursing homes can be high, because many residents need assistance with activities of daily living, including bathing, feeding, transferring, and toileting. According to a Columbus Dispatch article, industry officials have defended their prices, stating that the daily cost of a semi-private nursing home room is comparable to that of a nice hotel room. The prices may be comparable, but who can afford the cost of a staying in nice hotel room every day? How Do People Pay Nursing Home Costs? According to AARP, approximately one-third of all nursing home residents pay the costs out of their own funds, which are often depleted in as little as six months. Approximately 5% have long-term care insurance, which covers nursing home and other types of extended care. Medicare covers short-term nursing home stays, as reported by AARP. For those who have no long-term care insurance, after personal funds have run out, Medicaid picks up the bill for long-term nursing home care. As stated by AARP, Medicaid covers the cost for about two-thirds of all nursing home residents. However, Medicaid is a federal and state funded program for low-income people and only available to those who have used up their resources. According to AARP, Medicaid will allow the spouses of people in nursing homes to keep their homes and some of their assets. As covered in the CNN Money article, assisted living facilities are a less expensive alternative, although they do not offer the same level of care as nursing homes. The national median monthly rate for assisted living, as reported by Genworth, is $3,600. Another alternative that manly elderly Americans are choosing is at-home care with homemakers and health aids. The national median rate reported by Genworth for this type of care is $20 per hour.